Servicing your Nissan at Mays Motors is the best way to protect its value. A full Nissan service history can help you to achieve stronger resale value, and the professional services that you receive will give you confidence and peace of mind. myNissan Service Certainty gives you the confidence of knowing that your vehicle is being serviced by factory-trained technicians using only Nissan Genuine Parts. Enjoy peace of mind each Scheduled Service at any Nissan Dealership throughout the program duration knowing that you’ll pay no more than the then current published price. 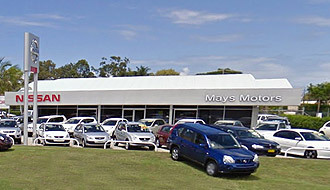 To check current pricing please contact Mays Motors on (02) 6686-2399. We can service your Nissan in around an hour*. Bookings are available for your vehicle at our Service centre to receive a full strength Nissan Handbook Service while you sit back in our lounge with a coffee and free internet**. Our Technicians use the latest techniques and always use Nissan Genuine Replacement Parts, you can rest knowing your car is in good hands. Great if you’re a tradie or a parent and you haven’t got much time on your hands. * Some exceptions apply, limited booking times available, vehicle servicing history and vehicle type. Contact your Nissan Service Dealer to find out if your vehicle is eligible for an Express Service. Any additional work requested to be undertaken at the time of servicing will take additional time. Patrol (Y61 & URY61) & Navara 4WD (D22) dismantle & regrease of LHS and RHS free wheel hub assemblies can increase service time. Please click here for full terms and conditions. ** Available at participating dealers. Further conditions and usage policies may apply. Contact your Nissan Service Dealer for full details.